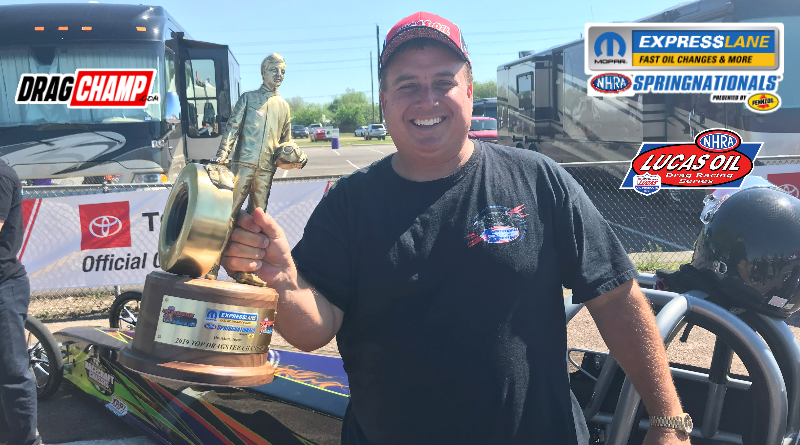 Baytown, Texas – Ross Laris collected his second national event Wally at the Mopar Express Lane NHRA Spring Nationals on Sunday. Laris and his Laris Motorsports Insurance team have teamed to win two national events and two Lucas Oil divisional events this season. In addition, Ross’s son Holden is leading the national standings in Super Comp. Laris was joined in the Houston Raceway Park winners circle by first-time national event winners Robert Rowan (Super Gas) and Vernon Rowland (Super Comp). Repeat winners included Pete Peery (Super Stock) and Jacob Pitt (Stock). Peery’s victory marked the second straight national that one of our DragChamp pre-race picks collected the Super Stock Wally. At the Denso Four-Wide Nationals in Las Vegas, Anthony Bertozzi carried the DragChamp flag to the winners circle. At each national event, the DragChamp sportsman event preview includes our picks to win each of the sportsman classes. Beginning with the 2018 U.S. Nationals, our pre-race picks have collected a number of wins and made multiple final rounds. Visit DragChamp prior to each national event to see our picks and follow along throughout the event. Pete Peery collected his fourth national event Wally at the Spring Nationals. Peery took a close final round decision over first-time finalist Darrin Christen. The win was Peery’s second Spring Nationals victory at Houston Raceway Park. Christen was perfect at the tree in the final but only had a slim advantage after Peery posted an impressive .002 reaction himself. As the moved down track, Peery lit the win light after his .018 over 9.198 eclipsed Christen’s .022 over 9.922 by .002-second. Both drivers were exceptional at the tree throughout the event as neither driver was worst than .026 during eliminations. Christen averaged a .014 light and Peery was slightly better with his .013 reaction time average. Peery, a DragChamp pre-race pick to win, posted victories against Terry Emmons, Slate Cummings, Dale Hulquist, and Phillip Giles to reach the final round. Just a week removed from his Lucas Oil divisional win at the Texas Motorplex, Jacob Pitt found himself in another final round. In his third national event final at the Spring Nationals, and fifth overall, Pitt collected his third national event win in Houston. Brett Candies, of the famed Candies Family race team, reached his third national event final round but came up .006 short against Pitt. Prior to the final round, Candies had ran dead-on his dial in three of the first four rounds. DragChamp picked Candies to win the event but in the wrong class. While Brett made the Stock finals, we had picked him to win in Super Stock. We were close but just missed it. The difference in the final was determined on the starting line. Pitt left first .021 to .028 and carried that advantage to the finish line. Candies posted a .017 over 9.367 to come up just short of Pitt’s .018 over 10.468. Pitt was solid at the tree during eliminations posting numerous .02 reactions while twice running dead-on his dial. One of the better finish-line drivers in the class, Pitt drove the finish line just as well as he worked the tree. With wins in consecutive weeks, Pitt put himself in a great position to chase the national championship. In winning his first national event in his first final round appearance, Vernon Rowland add to the Division 4 dominance of the class in 2019. After Craig Anderson won in Phoenix and Holden Laris won the Gatornationals, Division 4 competitors have now won three of five Super Comp Wally’s in 2019. Rowland made his first final round appearance in impressive fashion after wearing the tree out at the NHRA Spring Nationals. Rowland averaged a spectacular .010 reaction through six rounds of competition. He was .001 and .009 in the first two rounds and used an .008 in the final to stop Chris Vang. Rowland’s worst reaction of the event was an .018 in the semifinals. Chris Vang made the trip from Denver payoff with his second final round appearance at the Spring Nationals. Vang, a former Super Street champ in Houston, was pulling double duty this weekend. In addition to terrorizing the Super Comp field, Vang was a crewman the Team O Mountain Motor Pro Stock team. In the final Rowland used an .008 to .021 starting line advantage to win the double-breakout race 8.890 to Vang’s 8.873. Editors note, the final round included a minute long staging battle as neither driver wanted to stage first. To reach the final, Rowland defeated Rick Huffman, Jay Bunce, Tony Elrod, Jacob Elrod, and a red-lighting Keisha Moline. Robert “Bob” Rowan cleaned house at the NHRA Spring Nationals taking the event win from the number one qualifying spot. Rowan reached his first national event final round on the strength of his amazing reaction times. With lights of .008, .009, .017, .003, .003, and .002, Rowan left little room for his competitors. His .007 reaction time average is one of the best I’ve seen over the course of a multi-day national event. Defending Spring Nationals champion Koy Collier came one win light short of a repeat performance. Like Rowan, Collier was deadly at the tree averaging a .011 light across six rounds. Collier posted consecutive dead-on laps in rounds three and four. In the final, both drivers let go .00 at the hit. Rowan took a small advantage with his .002 light to Collier’s .008. He once again nailed the index to post his best package of the event, a stellar .010-pack to force Collier into a breakout. Rowan combined his .002 reaction with a 9.908 to capture his first national event victory. Collier was a little too quick at the finish posting a 9.882 in the loss. Rowan told DragChamp after the event that his friends had told him to get aggressive at the tree and that was his plan for the event. He worked that plan to perfection! As mentioned earlier, the Laris Motorsports Insurance race team has been on fire in the early part of 2019. With four event wins along with a runner-up, they have been collecting trophies at a rapid pace. This week, it was Ross Laris who stood tall in victory lane after collecting his second national event victory. Laris started the weekend by winning the coveted number one qualifying spot with a 6.106 at 228 MPH. After a first round bye, Laris got dialed in posting consecutive lights of .014, .012, and .022 to reach his seventh national event final round. In addition to his superb reactions, Laris drove the finish line like a champ taking .002 stripe in round three and .010 in round four. That’s pretty impressive at almost 230 MPH. William Kruse drove his blown dragster to his third final round appearance. Kruse was wired to the tree in the first few rounds going .009, .012, and .009. He also posted his best package in his round two tussle with Jim Thorpe. Kruse combined a .012 light with a dead-on nine 6.239 for a .021-package. Not bad for a de-tuned Top Alcohol dragster. Kruse prevented an all-Laris final round when he defeated Ross’s son Holden in round three. The win earned Kruse a bye to the final round. The final was anti-climatic as Kruse let go -.007 too early to hand the easy win to Laris. To see final round videos of each of the Lucas Oil Sportsman finals, click here. DragChamp is dedicated to bringing increased media awareness to sportsman drag racing. Visit daily for the latest sportsman drag race results, news, and events.